We offer exact OEM Magura front & rear brake master cylinder and hydraulic clutch master cylinder rebuild kits for most BMW bikes at 25%-40% off dealer retail pricing. 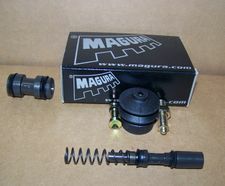 DUE TO THE RECENT LAWSUIT BROUGHT BY BMW AGAINST MAGURA, ONCE OUR CURRENT STOCK OF MAGURA PRODUCTS IS GONE WE WILL NO LONGER BE ABLE TO SELL ANY BMW SPECIFIC MAGURA PRODUCTS. SOLDTemp Out of StockNew Magura 20mm Front Brake Master Cylinder Rebuild Seal Kit For All K1004V/K1100 & R850/1100 (Except R1100S) Bikes.